Don’t you speak Spanish? The Spanish word for rice is arroz, which is fairly close to oryza. That's how I got it. Okay, say you know that neither exists and are only going off the "Oryza sativa" part. There are lots of plants that end in "something sativa", so that doesn't narrow it down much. Could you really not guess that there is a school called University of Houston? They really need to stop using "it sounds like X" as a TOM. That is the most subjective a TOM can possibly get. Cognates are a great way to learn vocabulary. Is there a reason you don't like to guess? At least in Final Jeopardy!, guessing can't hurt, and this clue was a very gettable one just from guessing a museum in France. The problem is, I couldn't name any museums in France. I know there is SOMETHING in France called the Louvre, but didn't know what it was. Keep trying on The Killers. You'll get more chances. Can we climb this mountain? I don't know. Try to look on the bright side. ...Oh, THOSE Killers. I actually know that song, too. Duuuuuuuuh. I agree about Ants on a Log. I've never heard of that, either. I'm one person (Californian in his 50s) and the clue was no problem since I've had direct experience with them. There are other variations and names and Wikipedia has the snack being around since the 1950s. Regional does not seem right as I cannot imagine it's only some kind of California healthy thing. I can happily say that my mom never tried foisting a 'snack' based on celery onto me during my childhood. Celery makes a wonderful peanut butter delivery system. That's assuming I want peanut butter in the first place. You could want any kind of butter for all I know. 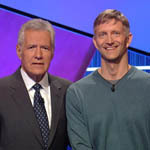 I had a dream that I was asleep and then I woke up and Jeopardy! was on. So what were the keywords on this FJ! anyway? There's lots of immortality and there are lots of warriors in Greek mythology. Make it a Venn diagram keeping in mind it's the FJ! round of the College Championship. It's one name in my opinion.